Hello hello! I've been away from the blog for a long time, but I have a good excuse: A nasty bout of food poisoning completely destroyed my appetite for a couple of weeks. The dish I'm sharing today was the first one that I could eat with relish after my recovery. It comes from a book called "Please to the Table" about the cuisines of the ex-Soviet countries. Before I checked this gigantic tome out of the library, I didn't know much about Russian food. Sure, I had vague notions of bland, sour cream-laden fish and potato dishes, but the book pleasantly surprised me with its wide range of vegetable and meat recipes, not to mention delicious-sounding dishes from the Caucasus, the Baltics, Uzbekistan and the Ukraine like a saffron pilaf with pomegranate, chicken with walnut-garlic sauce and a wild mushroom "caviar". Caviar seems to be the term applied to a wide range of minced cooked vegetable spreads. 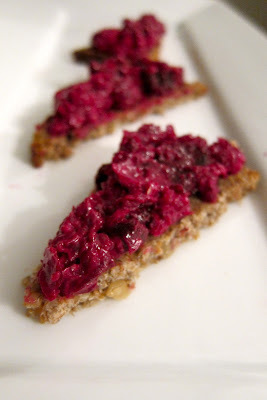 I fell in love with this roasted beet caviar after I made it for a holiday dinner. It gets just the right amount of sweetness from some prunes and a nice crunch from walnuts. It's perfect served with pumpernickel bread, or shoveled in straight from the bowl if you are ecstatic about recovering your appetite after food poisoning like I was! Adapted from here. This is best made a day ahead, which gives the flavors time to meld and mellows out the garlic. If you are going to serve immediately, use less garlic than called for in the recipe. Bremzen has you first soak the prunes for 30 minutes in brandy but I've omitted this step as it didn't make too much difference to the taste. You can also boil or steam the beets, although their taste will be less intense. Served on triangles of black or pumpernickel bread, this makes enough appetizer portions for 8-10 people. 1. Heat oven to 400F (200C). Wash the beets and wrap them in tightly in foil. Roast for 40-50 minutes until easily pierced by a sharp knife. 2. When the beets are cool enough to handle, peel them and cut into a few pieces. Pulse in a food processor until minced (but not pureed). 3. Mix the beets with the next five ingredients. Stir in 3 tbsp mayonnaise, then more if you feel the mixture isn't creamy enough. (Don't worry if the garlic tastes too sharp at this stage, it will mellow as it sits.) Season with salt and black pepper and chill until serving. The holidays are almost upon us and for those of us who are culinarily inclined, that only means one thing: Cookies. My kitchen is under a perpetual haze of flour these days. But much as I like cookies, I have to admit that all the butter and sugar can make them too heavy and cloying. While searching for a lighter, but still festive, alternative to my regular cookies, I came upon this recipe which I had clipped out of a magazine a couple of years ago. The minute I read the words rosemary and pine nut biscotti, I was sold. I love rosemary, whether it's in a marinade for grilled lamb, on a crostini with honey, walnuts and goat cheese, or infused into a simple syrup to be added to fizzy cocktails. Biscotti are Italian cookies with a dense, crunchy texture which comes from being baked twice. These are made with olive oil rather than butter, and are not too sweet. They are easy to make, too: Just stir everything together, bake, let cool, then slice and bake some more. The olive oil and rosemary give them a haunting, woodsy flavor. Add in crunchy cornmeal and buttery pine nuts, and I can definitely say that these biscotti are the most elegant things to ever come out of my kitchen. Dunk them in coffee, pack them in a box to gift them, or just eat them by the handful like I did. Adapted from Eating Well magazine. The biscotti can be kept in an airtight container for 3-4 days. Makes approximately 20 biscotti. 1. Preheat the oven to 350F (175C). Lightly brush a baking sheet with olive oil. 2. Thoroughly mix the flour, cornmeal, pine nuts, rosemary and baking powder in a large bowl. 3. Whisk the eggs, sugar, oil and salt in a medium bowl just until combined and uniform (but not until the sugar dissolves). 4. Stir the wet ingredients into the dry ingredients to form a dough. Transfer to a lightly floured surface and form into a 12x2.5 inch (30x7 cm) log. Transfer to the oiled baking sheet. 5. Bake for 30 minutes. Let cool on the baking sheet for 15 to 20 minutes. 6. Reduce oven temperature to 325°F (160C). With a serrated knife, gently slice the log crosswise into 1/2-inch-thick slices; place them cut-side down on the baking sheet. Some of the slices might break apart and that's OK, just bake them and save them for yourself. 7. Bake for 10 minutes. Turn over and continue baking for 10 minutes more. Cool on the baking sheet for 5 minutes, then transfer the biscotti to a wire rack to cool completely. I have a new love these days. We have been spending quite a bit of time together, and I have to say, it's going really, really well. You want to know who it is? Well, I'll tell you: It's the public library. Yes, that dusty-looking, neglected building in your city that you've been passing by all the time without a second glance. I was just like you. Once I left school, I never stepped foot inside a library again, until a few weeks ago when somebody told me that the public library stocks tons of cookbooks. Given my addiction to the latter, it shouldn't surprise you that I didn't wait too long before registering for a library card! There is something about libraries that always takes me back to my college days. My university had a huge library. You would enter it through a gorgeous, airy marble rotunda, then branch off into hallways and stairs that would take you to the different rooms. I used to love spending time there, studying in the quiet corners among stacks of forgotten books that hadn't been checked out in years. There were classic Hitchcock movies in the A/V department, Chopin sheet music in the music room, and books, oh, so many books. To my book-loving geeky heart, the library was like a treasure cave. I would borrow Beatles autobiographies, Neil Gaiman novels, books on everything from Greek mythology to the making of Blade Runner, and be happy as a clam. I am so glad to have found my way back to libraries, even if I am now far from the wonderful sunny library of my college days. The first book that I borrowed from the public library is one whose name you'll hear often if you read food blogs: the renowned The Zuni Cafe Cookbook, written by the head chef of the eponymous restaurant, Judy Rogers. Rogers takes on Italian and French foods with a California sensibility and the book is chock full of innovative combinations. Some of her recipes are too fussy for my taste, but there are simpler preparations like a risotto with grapefruits and oranges, short ribs braised in Belgian beer, and a pesto of sage and walnuts that I am looking forward to trying out. The one recipe that I've already made, presented below, was an absolute winner! This appetizer, which pairs Fuyu persimmons with ephemeral slices of air-dried beef, is Judy Rogers' elegant take on the Italian classic of melon with prosciutto. The Fuyu persimmon is a mild, not-too-sweet fruit with a delightful star-shaped cross section. It tastes a little bit like canteloupe melons and can also be sold under the name "sharon fruit". Don't substitute the torpedo-shaped Hachiya persimmons, which need to ripen to the texture of jelly to be edible and won't hold a sliced shape. 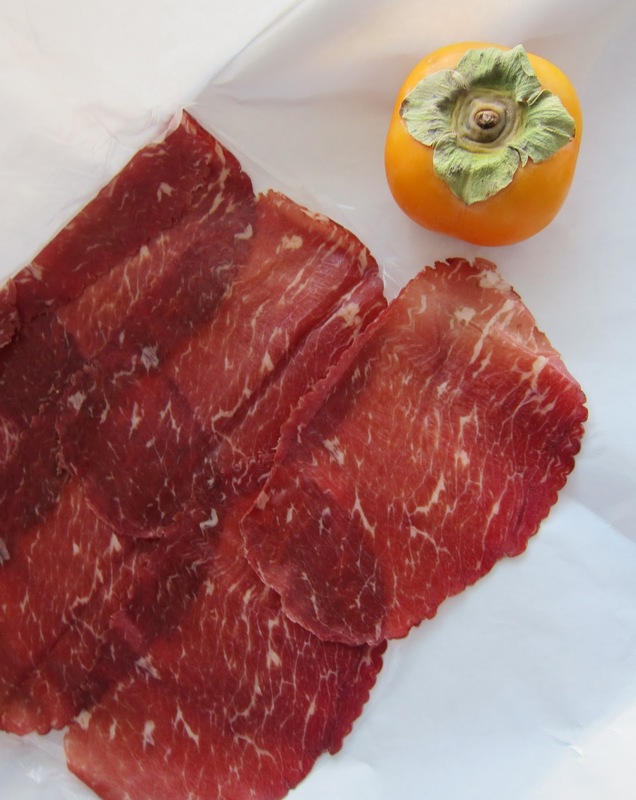 Most shops selling Italian foods carry bresaola, which is an air-dried cured beef. Bresaola's creamy streaks of fat and its saltiness make a delicious counterpoint to the sweet persimmons in this recipe, but Rogers also has instructions for serving it in a salad with fromage blanc and lemon-infused olive oil, or with butter lettuce and a vinaigrette with cracked coriander seeds. Don't wait too long to make this after you purchase the bresaola, as it dries out and toughens in the fridge after a few days. Adapted from The Zuni Cafe Cookbook. The original recipe can be viewed online here. Persimmon skin is edible but some have thicker skin than others. Rogers instructs you to taste two slivers of persimmon, one peeled and the other not, and to peel the fruit if you decide you don't like the skin. Serves 4 as an appetizer. 1. Cut out the stem of the persimmons and cut the fruit horizontally into thin slices. 2. Lay the persimmon and bresaola slices haphazardly on a large platter. Drizzle on a small bit of of olive oil and an even smaller bit of balsamic vinegar. Tilt the plate in a couple of directions to distribute the oil and vinegar, lifting the fruit and meat slices if necessary so the dressing can flow under them, and serve. Phew. I hope everyone had a nice Thanksgiving! Mine was great fun, even though I drank a full bottle of champagne and felt kind of lousy the next day... But let's not talk about that! There was juicy turkey, mashed potatoes and apple-cranberry-maple pie and that's all that matters. Of course, now that the big feast is behind us, I have a huge craving for something light and healthy and not bloat-inducing. Larb gai is just such a dish. Most people who have been to the popular Chinese-American restaurant chain P. F. Chang's are familiar with its chicken lettuce wraps. In fact, they have almost a cult following. I, on the other hand, cannot see the appeal of that dish, as the chicken filling is terribly bland. This Thai lettuce-wrapped chicken is much better. Imagine tender minced meat; its seasoning perfectly balanced - like all Thai dishes - between salty, sour and spicy; enlivened with a shot of lime juice and served with an exuberant shower of fresh herbs. Is your mouth watering yet? The key to good larb is to use very fresh, crisp lettuce and herbs. Discard any browned or wilted leaves. 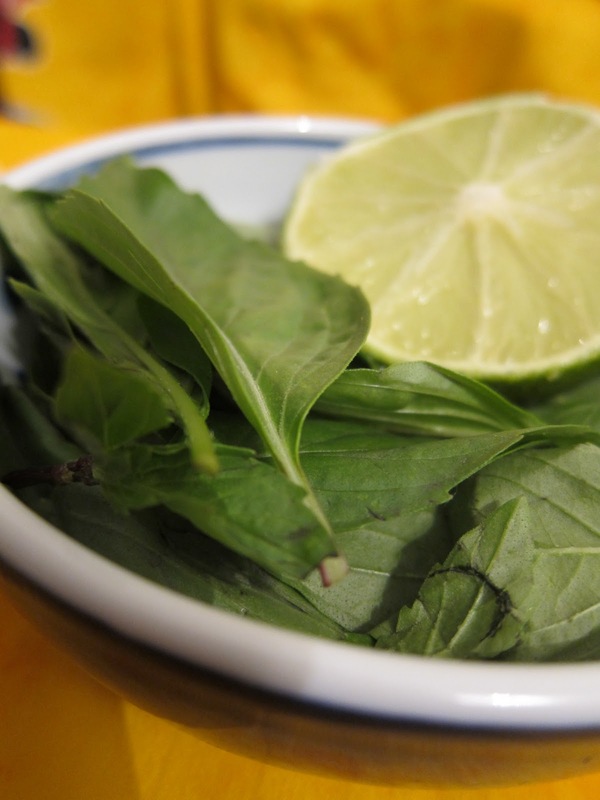 The traditional herbs are mint and cilantro. I cannot abide the latter, so in keeping with the Thai theme of the dish, I substituted Thai basil, which tastes more anise-y than regular basil. Its stems are purple and the edges of the leaves are slightly serrated. You can see it next to the mint in the photo above. The substitution was delicious, but feel free to use cilantro if you can tolerate it. Be very generous with the herbs! The other key is to use fish sauce instead of soy sauce or salt. As I've said before, its pungent odor dissipates once it's added to the dish. Don't be afraid of it! The ingredients for this dish can all be found at the supermarket. The only exception is the toasted rice powder, which is nothing more than roasted and ground up rice. It gives a nutty taste to the meat and thickens up the juices. of the meat Please don't omit this ingredient - you can make it in five minutes at home. Instructions follow the larb recipe. The amounts of seasoning that I've given are all approximate. You should set out small bowls of fish sauce, lime wedges and chili powder on the table so that each diner can further season his portion according to his preference. I've substituted ground turkey for the chicken here. You can use any kind of white or red meat as long as it is not super lean. Add steamed sticky rice to each serving if you want to make this into a more substantial meal. If you follow a gluten-free diet, make sure the fish sauce you buy doesn't include any gluten. Serves 4 as an appetizer or light main course. 1. Wash and dry the lettuce leaves in a salad spinner. Combine the lime juice, fish sauce, chili powder and shallots in a small bowl. 2. Heat a nonstick pan over medium heat. (If you don't have a nonstick pan, add a couple of spoonfuls of water or chicken stock before the meat.) Add the chicken or turkey and cook, stirring occasionally, until no pink shows. The meat will release its juices then reabsorb them. Don't let it brown and don't let it reabsorb all the juices. It should be just-cooked and a bit moist. 3. Stir in the lime juice, fish sauce, chili and shallots and cook for 30 seconds. Add the toasted rice powder, stir for another 30 seconds and take off the heat. Taste and add more lime juice, fish sauce or chili powder if needed. Stir in the chopped herbs. 4. Serve with the lettuce leaves, extra herbs and lime wedges. Each diner should create his own wraps after adjusting the seasoning of his larb. The toasted rice is pulverized very easily in a spice or coffee grinder. I simply empty my pepper mill and grind it there. 1. Heat 2 tbsp of white rice in a small pan over medium heat, stirring occasionally, until golden brown. Let cool, then grind to a powder. All Thanksgiving related posts here. My intention today was to take on that Southern classic: Sweet potato pie. I adore sweet potatoes no matter how they are cooked and thought that the pie would be a great addition to the Thanksgiving menu. Yet, when I went to the store, I saw some purple yams on sale and inspiration struck: Why not use these as the filling? I thought the bright purple color would bring a touch of whimsy to the table. Purple yams are even sweeter than sweet potatoes. When cooked for a long time, their flesh takes on a jammy consistency and an almost caramel taste. My mother hit upon it: They taste exactly like a less sweet version of the chestnut cream used in European and Turkish desserts. The yams are great cut into wedges and roasted at high heat with a bit of oil. You'll be astonished at how delicious they smell while roasting. However, I'm usually too lazy to peel and cut them, so I eat them simply baked and slathered with creme fraiche. The latter, which can be thought of as the less tangy French cousin of sour cream, is an amazing partner for the yams - each has a certain nuttiness that is echoed in the other. I'm not a fan of sweet potato or pumpkin pies that mask the taste of the vegetable with tons of spices, so I used only a small pinch of nutmeg in this pie. The flavor of the yams comes through bright and clear. The filling was not as brilliantly purple as I would have liked, but the taste of the chestnut-y yams combined with the rich creme fraiche more than made up for it. Purple yams are available at farmer's markets and many large groceries, but if you cannot get your hands on any, this would be just as good with regular sweet potatoes. Purple sweet potatoes, which are technically a different vegetable than purple yams but taste pretty similar to the latter, would also make a good substitute. I find this pie is best if made one day ahead and chilled overnight. The filling is a touch mushy right out of the oven but a night in the fridge firms it up nicely. Make the crust and chill it while the yams bake and cool. Feel free to use your own pie crust recipe instead of the one provided below. For added textural interest, you can sprinkle some chopped pecans into the crust before pouring in the filling. Serve with creme fraiche or whipped cream on the side. 1. Bake the yams in a 400F (200C) oven until a sharp knife goes through them the same way it would go through butter. Lower the oven temperature to 350F (175C). Peel, mash and cool the yams. 2. For the crust, mix the flour and salt in a bowl. Mix the butter and milk in a small bowl and add to the flour. Stir until the dough comes together. 3. Gather the dough into a ball with your hands. Roll it out between two sheets of waxed paper. Peel it off the paper and transfer it to a 9 inch pie plate. Chill the dough in the fridge while the yams are baking and cooling. 4. Mix the salt, sugar, nutmeg and creme fraiche into the yams, then beat in the eggs and butter with a mixer until the filling is smooth. Pour the filling into the pie crust. The filling will expand a bit in the oven, so don't fill the crust to the rim. If there is too much filling, you can bake it in a small dish alongside the pie and have it as a pudding. 5. Bake at 350F (175C) for 50 minutes. Check the crust around the 40 minute mark. If it is browning too much, cover it with a little foil. Let cool completely before serving. Thanksgiving is almost upon us again. All the food magazine covers are adorned with burnished turkeys and the Thanksgiving posts I wrote last year are getting more and more hits every day. In 2010, I used a simple strategy of making everything but the turkey ahead of time, which let me have a stress-free evening and enjoy the company of my fellow diners. You can find the write-up of this simple, make-ahead Thanksgiving meal here. I'm particularly fond of the turkey recipe as it roasts in only seventy minutes and has delicious, crispy skin. If I cook again this year, I will definitely use the same method! Although I adore traditional Thanksgiving foods, the meal as a whole is often a butter and cream-laden starch-fest. My palate is not used to such heavy foods and once at the table, I find myself wanting something light and acidic. While brainstorming ideas, I came up with this butternut squash and lacinato kale salad. Its bright, mustardy dressing cuts through the richness of the meal and the jewel-toned vegetables make a nice complement to the cranberry sauce and turkey on your plate. Toasted pine nuts and sweet currants add a festive touch. Lacinato kale (also called Tuscan kale) is one of my favorite vegetables. It is normally too tough to eat raw, but there is a trick to making raw kale edible: Salt it a little bit ahead of time and let it sit. The salt will draw water out of the kale which causes the leaves to wilt just enough to be edible. You can use the same trick with shredded cabbage to make coleslaw. This salad can be made largely ahead of time, which is a boon for Thanksgiving. Roast the squash, make the dressing and cut the kale leaves up to a day before the meal. Refrigerate all components seperately. On the day, wilt the kale, then toss with the dressing before topping with the pine nuts and currants. Speaking of the latter two, they can be substituted with dried cranberries and pecans to give an even more colorful salad. I used pumpkin in this salad, but any kind of flavorful winter squash, or even sweet potatoes, will do. You can either roast the squash halves whole, or after dicing them. The second method will give more delicious browned surfaces but the first method is easier. Don't substitute the lacinato kale with regular curly kale, the texture doesn't quite work. Even if you do prepare the salad components ahead of time, toast the nuts at the last minute. If your dried currants are tough and shriveled instead of plump and moist, let them sit for a few minutes in hot water before draining and adding to the salad. Serves 8 as an appetizer or side dish. 2. While the squash is cooling, stack the kale leaves and cut them length-wise into 1/4 inch thick strips. Put them in a colander and add a generous amount of salt. Don't worry about oversalting as you'll rinse the kale later. Massage the salt into the leaves for 2 minutes, then let sit for 15-20 minutes. 3. Toast the pine nuts in a small dry pan over medium heat, stirring occasionally, until golden. Let cool. 4. Once the squash is cool, peel it and cut into 1 inch cubes. Season the cubes with some salt and pepper. Hold the colander with the kale leaves in it under running water to rinse off the salt, then drain. Combine the oil, vinegar and mustard in a jar and shake to emulsify. 5. To assemble the salad, spread the kale strips on a wide plate. Toss with half the dressing and season with salt and pepper. Put the squash cubes in the center and drizzle on the rest of the dressing. Top with the nuts and currants and serve.